Sturgills Wholesale Christmas Tree Farms are located in the heart of the Blue Ridge Mountains in the northwest corner of North Carolina. Sturgill Tree Farms have been providing some of the most beautiful Christmas Trees including Fraser Fir, Blue Spruce and White Pine for over 30 years. Operated by Charles Sturgill and his family, it produces trees consistently known for their beauty, symmetry, and depth of color. 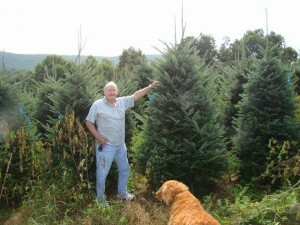 With Christmas tree farms located in five different counties in Western North Carolina, Virginia, and West Virginia, Sturgill’s produces some of the largest Fraser Firs in the High Country region. Our hand-crafted holiday Fraser Fir Wreaths are individually assembled and can be decorated with basic ornaments such as pine cones, bows and ribbons, or they can be done up with specialty elements that reflect a custom theme of your choice. We can also provide Fraser Fir, Blue Spruce, and White Pine garland roping and mantle pieces in different sizes to accommodate your requirements. If you’re looking for Wholesale Christmas Trees, Wholesale Wreaths, Garland and Roping to spruce up your holiday decorations, Sturgill Tree Farms would be honored to serve your needs and exceed your expectations.